St Mary Magdalene Academy is made up of two schools: the Primary School and the Secondary School, including the Sixth Form. The Academy is sponsored by the London Diocesan Board for Schools and is a Christian community of learning which aims to nurture young people to become high achievers and to discover their vocation in a global society. 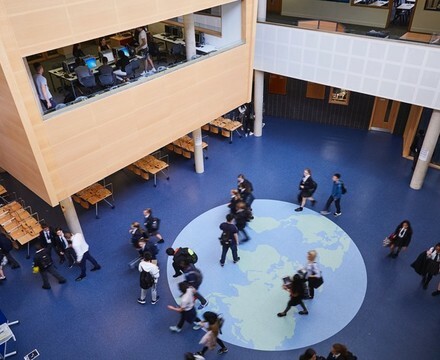 We welcome pupils and students from all faiths and none to our schools, which strive to be inspirational communities of learning focused on happy, successful children. Our motto is: Show by a good life that your works are done by gentleness born of wisdom (James 3:13). The motto succinctly captures our aspirations and our focus on developing a set of values which will allow our young people to grow into contributory citizens in our local, national and global community. Our core values of Trust, Compassion, Forgiveness, Integrity, Resilience and Thankfulness clearly come from our Christian foundation but are appropriate to a life lived well in any community. The Courtyard is a free school sponsored by St Mary Magdalene Academy. It is a special school for 14-19 year old students who have a diagnosis of autism spectrum disorder and/or speech language and communication needs. We see ourselves as a ‘family’ of schools who share not only core values, but also expertise. We have come to recognise that with the right level of commitment, the impossible can be achieved very quickly; it’s only miracles that take a little longer! We expect that commitment to achieving the impossible from staff, pupils, older students and parents. Our experience tells us it can be done, if the desire is great enough. Education is the great engine of personal development. It is through education that the daughter of a peasant can become a doctor, that a son of a mineworker can become the head of the mine, that a child of farm workers can become the president of a great nation. It is what we make out of what we have, not what we are given that separates one person from another.